Summer sale background. Season vacation, weekend. 插圖素材: Summer sale background. Season vacation, weekend. 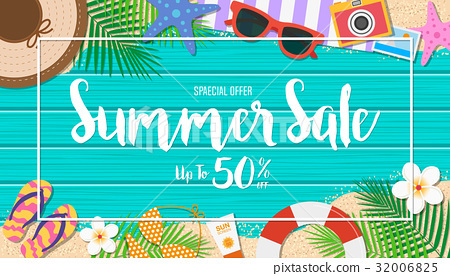 Summer sale background. Top view with sunglasses, sun screen, starfish, camera, flip flop, lifebuoy, flower, bikini and leaf on blue wooden background. Season vacation, weekend. Vector Illustration.